Shawl, Hispanic. Collected by Edward Palmer in Mexico. Acquired by the Smithsonian in 1891. Department of Anthropology, National Museum of Natural History, Smithsonian Institution, cat. no. E152700, acc. no. 00024600. Dimensions: 82 in. (warp without fringe) x 30 in. (weft); fringe = 13 in. 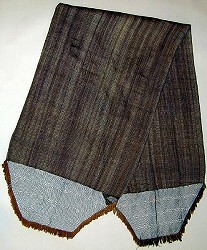 Technique: Warp-faced plain weave, ikat dyed warps. Thread count: Warp = 56/in. Weft = 20/in. Fibers: Fine commercial cotton yarn, white and ikat-dyed blue and brown. Design: Blue, brown, and white stripes with net-like ends. A brown fringe, made from warp yarns, is sewn on each end.